On Long Island, Vietnamese food has been hard to come by. If one had a hankering for Vietnamese, they would have to venture closer to the boroughs. 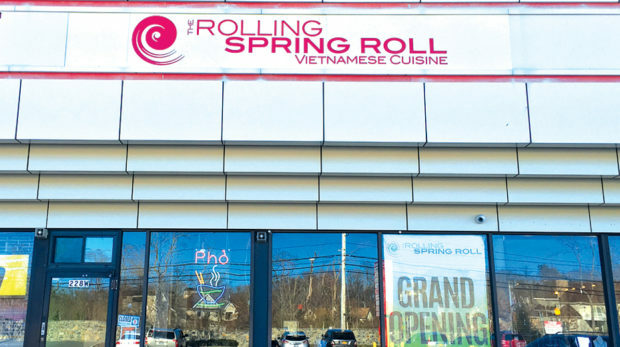 Luckily, Long Islanders no longer have to spend their money gassing up the Land Rover to get quality Vietnamese fare because amidst the slew of Chinese/Asian-Fusion/Japanese/Thai takeout/ sit-down eateries on Long Island there is one that stands out from the crowd: The Rolling Spring Roll. The Rolling Spring Roll is a Vietnamese eating place that, of late, has been getting a lot of attention. Droves of people are headed toward Farmingdale, and now Syosset, for fresh and delicious food. The story behind The Rolling Spring Roll involves Chef Joe Bui. Entrepreneur Joe, who is usually in the kitchen cooking up many of the recipes his mother made for him, just wanted to introduce Long Island to the ethnic food that he had grown accustomed to growing up. In the beginning, Joe served Vietnamese fare out of a food truck that’s where the “rolling” part comes in. Since then, Joe’s food caught on and very quickly The Rolling Spring Roll became a huge success which is why The Rolling Spring Roll is no longer “rolling.” Instead, Joe has settled into two non-rolling restaurants one in Farmingdale, the other in Syosset. 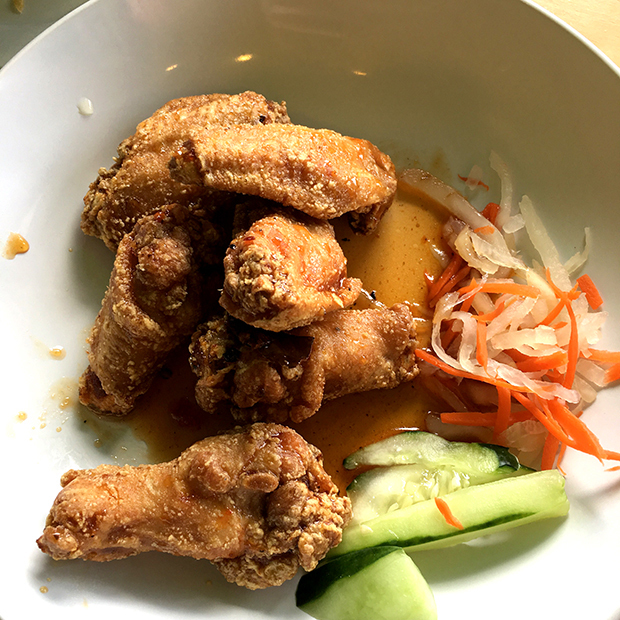 Considering The Rolling Spring Roll’s bright, clean, casual atmosphere, and healthy fresh fare, and popularity, it seems this place is just what Long Islanders are looking for to replace that weekly addiction to greasy, salt-laden Asian take out. In my humble opinion, it’s the simplicity. 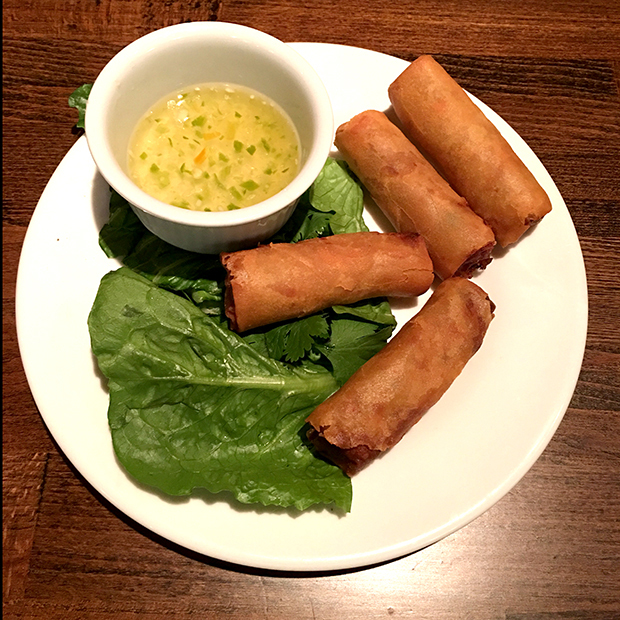 The Rolling Spring Roll offers authentic Vietnamese food, a short and simple menu, and lots of flavor served in a casual family atmosphere. One caveat when ordering at the RSR, Joe and Co. do not entertain “substitutions.” In other words, The Rolling Spring Roll doesn’t “roll” with it when it comes to mixing up the ingredients. Nonetheless, and notwithstanding a measure of menu rigidity, diners will not be disappointed. For starters, the menu offers what gave the restaurant its name – spring rolls! These spring rolls are crunchy and delicious and served with a vinaigrette that, if no one was looking I might drink. That’s how yummy it is. These amazing starters are available for meat eaters and vegetarians as well. The RSR features many other traditional Vietnamese dishes as well. For example, there’s Pho, pronounced, F-AH. 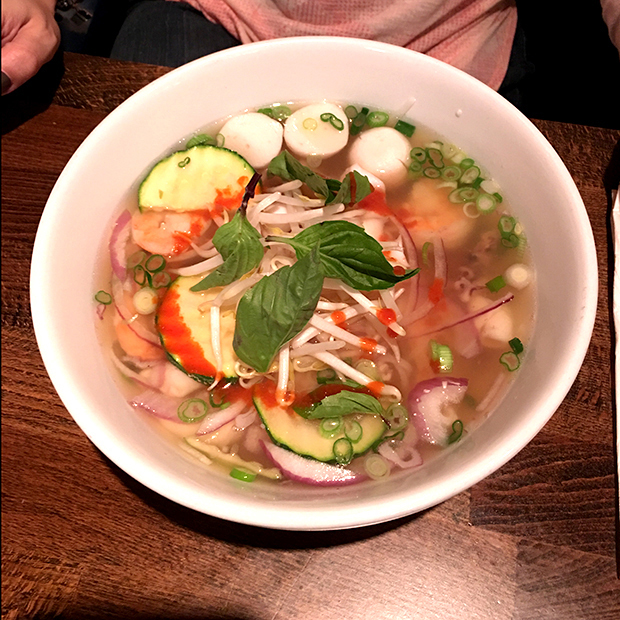 Pho is a bowl full of rice noodles and broth with vegetables. There are choices between beef, poultry, fish or just vegetables. Pho comes with a side plate of crunchy bean sprouts, basil and cilantro as well as lime wedges, to squirt into your soup. Next to the metal chopstick container that remains on each table is the Hoisin and Sriracha sauces, both of which can be added according to taste. I call Pho a big bowl of slurping-noodle comfort that is both satisfying and light. Other items on the menu include different types of Bahn Mi. Bahn Mi is a Vietnamese sandwich or what we Long Islanders call a hero. The difference is that Long Islanders don’t often get to order up a pork-belly hero at the local deli. What makes Bahn Mi stand out is the unique ingredients that are added to the sandwich. At The Rolling Spring Roll Bahn Mi is served on a toasted baguette and features fresh crunchy pickled herbs and vegetables. Bahn Mi choices include Angus Beef Satay with Peanut Sauce, Grilled Lemongrass Chicken, Grilled BBQ Chicken, and for my veggie friends – tofu. Like Farmingdale, the newly opened Syosset location has a laid back atmosphere, more space, and a larger dinner menu. After waiting on line in Syosset and being seated I sampled the grilled shrimp. The dish was fresh and tasty. For those of us you choose to imbibe, there is also a nice selection of Asian beers and a small selection of wine. If you choose to pass on the adult beverages there Vietnamese iced coffee, which is a dark brew shaken with sweetened condensed milk. It’s dessert through a straw. Speaking of dessert, there’s two choices, one with banana, coconut milk and tapioca and Che Dau, which is a Vietnamese bean desert. So the next time wonton soup and egg rolls call your name, put the fried rice on hold and head toward The Rolling Spring Roll for Bahn Mi and a hot steaming bowl of slurping-good Pho. Oh, and bring a bib. Marisa is a wife and mother of two boys. Marisa is a proud special needs autism mom, has a B.S in nutrition from LIU CW Post Campus, and is a Registered Dietitian. In addition, Marisa has worked in the restaurant industry, and currently is employed full-time in healthcare. She has a passion for all things edible, nutrition and health, enjoys cooking for her family and researching the latest diet trends. She also loves to crochet and exercise her DIY skills.